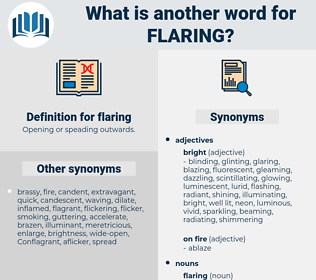 What is another word for flaring? 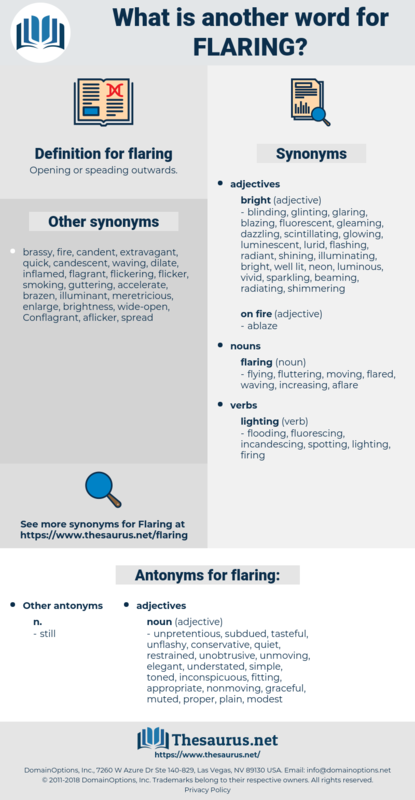 deteriorating, exacerbating, erupting, aggravating, escalating, fuelling, worsening, blazing, widening, deepening. unpretentious, subdued, tasteful, unflashy, conservative, quiet, restrained, unobtrusive, unmoving, elegant, understated, simple, toned, inconspicuous, fitting, appropriate, nonmoving, graceful, muted, proper, plain, modest. As the soldier glanced warily in every direction, two lights left D'Aulnay's camp and approached him, jerking and flaring in the hands of men who were evidently walking over irregular ground. The white table gleamed more whitely than ever under the flaring gas.